You might call it the Olé Claire festival. Wisconsin indie music hero Justin Vernon of Bon Iver fame is taking his experiences and friends from his third annual Eaux Claires Music & Camping Fest and bringing them south of the border for a four-day winter retreat near Cancun, Mexico. 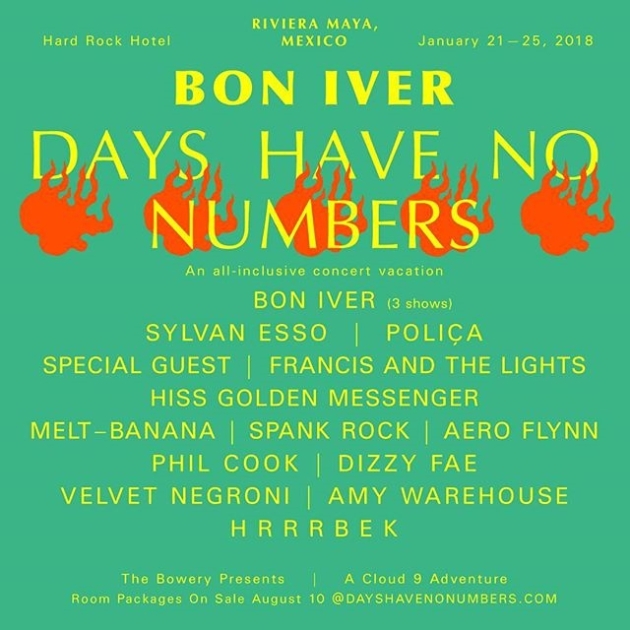 Dubbed the Days Have No Numbers (after a lyric in the Bon Iver song “00000 Million”), the beachside mini-fest will take place Jan. 21-25 at the Hard Rock Hotel in Riviera Maya, Mexico. Other performers will include such frequent and past Eaux Claire acts as Polica, Sylvan Esso (who have two sold-out First Ave shows this Sunday and Monday), Francis & the Lights, Hiss Golden Messenger, Melt-Banana, Phil Cook, Spank Rock, Aero Flynn, Minneapolis hip-hop stars Dizzy Fae and Velvet Negroni and "special guests." Vernon certainly isn’t the first rocker to dream up his own Mexican getaway with fans. Everyone from My Morning Jacket and R.E.M.’s Peter Buck to Sammy Hagar and Twin Cities pub rocker GB Leighton have done it. For a guy who famously wrote his first album in a deer-hunting cabin over a long winter, though, it’s something of a surprise. Days Have No Numbers will feature the Bon Iver-style twist of involving one day of “service” to the local community and a fundraising campaign for local school children. Vernon is promising three different Bon Iver performances during the fest. Like his Eaux Claires fest, the music will be spread out on different stages in different settings, including a lagoon sunset stage and late-night sets.